In a rain-delayed game that started on Thursday, the Rome (Ga.) Braves defeated the Hickory Crawdads 7-3 in front of a season high 4,423 fans at L.P. Frans Stadium. The Braves (23-24) surpassed the Crawdads as the hottest team in the South Atlantic League with their sixth straight win and are now 4 ½ games behind first place Greenville in the Southern Division. The Drive lost on the road at Lexington. Hickory (32-15) saw its lead in drop to 4 ½ in the Northern Division, as West Virginia defeated Delmarva on the road. The Crawdads and Braves are scheduled to play a doubleheader Saturday starting at 4:30. The game started Thursday night with Austin Pettibone taking the hill for Hickory. Omar Obregon (2-for-5) singled to left and stole second before Jordan Edgerton walked. One out later, the rains came and washed out play the rest of the evening. When play resumed on Friday, Collin Wiles (5-2) took over on the mound and gave up an RBI single to the first hitter Matt Tellor. The Crawdads evened the score at 1-1 against Caleb Beech (5-2) in the fourth on three hits and an RBI groundout by Eduard Pinto. They then took the lead in the fifth on Josh Morgan’s RBI single. But the Braves evened the score in the sixth on Braxton Davidson’s run-scoring single, and then went on to score in four consecutive innings for the win. Ozhaino Albies chased Wiles with a two-run, go-ahead triple in the seventh. Back-to-back doubles by Tanner Murphy and Connor Oliver added a run in the eighth. Two errors and a hit batter led to a run for Hickory in the eighth and brought the go-ahead run to the plate in Marcus Greene. He lifted a deep fly to left that the wind knocked down at the wall. Obregon tripled and scored on Edgerston’s single to provide the final margin in the ninth. **Collin Wiles actually cruised much of the game for Hickory. He used his usual three-pitch (fastball, change, curve) mix effectively to keep the Braves hitters off balance. Wiles pounded the strike zone much of the night (70 pitches, 50 strikes) His curveball was responsible for all three of his strikeouts, including two in the fourth (one swinging, one looking). For the most part, his fastball stayed down, though as the game wore on the pitch drifted off the plate on his glove side. The last pitch (88 mph) was middle-in and was spanked by Albies for the decisive triple. **Rock Shoulders with a heads-up play ran hard on a strikeout/ wild pitch in the seventh and was able to get to second when the catcher Tanner Murphy couldn’t find the ball at the backstop. He also appeared to “take one for the team” on an 0-2 curveball by reliever Oriel Caicedo to load the bases in the eighth. In the field, Shoulders also made a nice play on a hard hit grounder to turn a 3-6-3 DP. **Marcus Greene and Michael De Leon teamed up for a nice caught stealing in the sixth. Greene corralled a 2-2 curveball from Wiles, then sent a throw to De Leon, who scooped what appeared to be a short hop at the bag and dropped the tag on Davidson. **The Crawdads are phenomenal in the infield, unless you bunt against them. Simply, they do not defend the bunt well, at all. Tonight, with a runner on first in the decisive seventh, Erison Mendez sent what appeared to a generic sacrifice bunt to the right of the mound. Both Shoulders from first and Wiles charged the ball on the play, but Demeritte was slow to get to the bag at first, so no play could be made. **A baserunning blunder thwarted a chance for a big inning for the Crawdads in the fourth. After De Leon and Luke Tendler singled, Jose Trevino sent a soft liner to shallow left field. Crawdads manager Corey Ragsdale coaching at third immediately threw up a stop sign for De Leon, but Tendler rounded the bag too far at second. With Tendler caught in a run down, it forced De Leon to make a break for the plate and he was thrown out. Pinto’s 4-3 grounder scored Tendler, but that was as far as the inning went. **Hickory hit into a little bad luck at times in the game. Normally a heavy groundball pitcher, Beech had problems spotting his fastball early with the Crawdads hitting several fly balls in the second and third that were run down. However, Beech found a groove with his slider in the middle innings and fanned six with it from the fourth through seventh. Jose Cardona did get a fastball up in the seventh, but his liner was snagged on a leaping catch by Albies at short. **Had Greene’s at bat occurred a couple minutes earlier in the eighth, his fly ball to deep LF likely leaves the yard for a go-ahead grand slam. But a nearby thunderstorm passing just to the east of the ballpark shifted the wind in from left and knocked the ball down near the wall. ** This particular umpiring crew of Alex Trujllo and Kyle Wallace has what seems to be an unhealthy machismo to play through heavy rain. Back in a game in April, they allowed play during an extended downpour before calling for the tarp—which the crew could not get onto the field in the mucked-over infield dirt. It happened again on Thursday, but with all the rain that fell, it made no difference as to the speed of which the tarp got onto the field. Four years ago, Gaston County native Jordan Edgerton helped lead South Point High to the state 3A title in baseball. Tonight, he returns to the region for the second time as a pro (Edgerton played in a four-game series at Kannapolis earlier in May) as the Rome Braves come to Hickory for four games starting with the resumption of a suspended game tonight. Edgerton expects a large contingent of family and friends to make the drive up Hwy. 321 to catch the series. After playing his college ball at UNC Pembroke, the All-Peach Belt Conference selection became the ninth-round pick of the Atlanta Braves last June. Edgerton said he was excited about coming to the South Atlantic League because of the number of opportunities to play in front of his family during the start of his pro career. He signed with the Braves and then went on to play for rookie level Danville (Va.) of the Appalachian League, where he hit .275 with 13 doubles, three homers and 43 RBI. He also showed a patient approach at the plate when he walked 29 times in 59 games with only 34 strikeouts. He was named to the post-season all-star team in the Appalachian League. Edgerton said that the first taste of pro life in the Appy League prepared him for a first full season at Rome. Edgerton enters the series with a slash line of .307/ .356/ .380 with 31 RBI in 42 games, though he is batting only .179 (7-for-39) in his last ten games. Trying to work out of his current slump is one of the lessons he is learning as a pro and is a different experience that his college days. As a huge Braves fan growing up in the Southeast, Edgerton was excited when Atlanta took him in the draft. He had a chance to meet some of the Braves major leaguers at spring training and during last fall’s instructional league. However, it was the chance to talk with Hall-of-Fame manager Bobby Cox that is the most memorable encounter yet. Back in 2012, Hanser Alberto, in many ways, was an afterthought in the infield. Three years later, he is a major leaguer. At the time that Alberto came to Hickory in April 2012, the Crawdads had Luis Sardinas, who was to be the starting shortstop. However, because of injuries to Sardinas in 2011 – and the wish to keep a prized prospect healthy for a full season – Alberto was here to split time with Sardinas, as well as spell regular third baseman Drew Robinson. By putting up a .337/.385/.463 slash line in 62 games, Alberto made the South Atlantic League All-Star Game roster and then received a promotion to Myrtle Beach after the first game of the second half. In the locker room the night of that bump-up, he was grinning ear-to-ear and hugging everyone he could find, myself included. I can only imagine what the scene was in Round Rock, Texas when he was told he was going to Arlington. I thought fans might enjoy some of what was said about Alberto when he was a 19-year-old kid in Hickory back in 2012. Prospects in minor league baseball sometimes are hidden. An organization may have such a wealth of players at a particular position that an otherwise decent prospect may get lost in the shuffle. The Texas Rangers, the parent club of the Hickory Crawdads, have such a problem at shortstop. At the big league level, Elvis Andrus is fast becoming an elite shortstop in the American League. Other names at short include 2011 Crawdads shortstop Jurickson Profar – currently among the elite prospects overall in the minors – and Luis Sardinas, currently one of two shortstops with the Crawdads and a top-20 prospect with the Rangers. 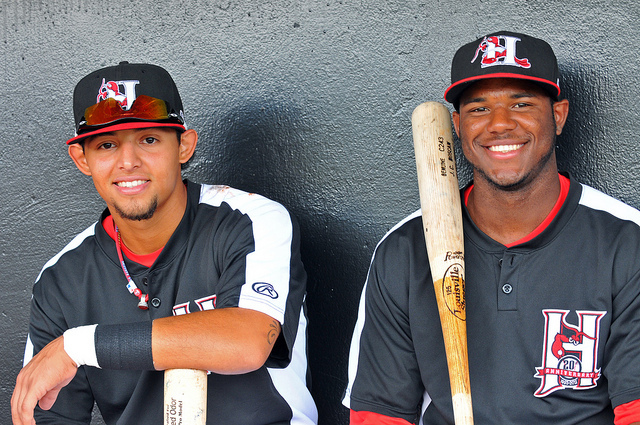 But there is hiding in the wings at Hickory is another shortstop: 19-year old Dominican Hanser Alberto. Over the first six weeks of the season, the native of San Francisco de Macoris, D.R has been among the most consistent player for the Crawdads. With that he has begun to make waves within the Rangers organization. He got his start in baseball like most kids in the Dominican, playing pickup games with other kids around town. But it was his father – a public address announcer at a local stadium – that saw the potential in Alberto to become a pro. Alberto was signed to a local baseball academy at age 13. A few years later, in 2008, he was part of a team that played in Chicago as part of a tournament set up by Major League Baseball. “After that, I started taking baseball more seriously because I had a chance to make it as a pro” Alberto said. His exploits on the field garnered the attention of several teams, including Atlanta, Pittsburgh, Kansas City before signing with the Rangers, who Alberto felt offered him a better chance to achieve his dream of playing in the big leagues. He made his pro debut with the Rangers’ Dominican Summer League team in 2010. After starting slow due to a groin injury, Alberto caught fire for the Rangers leading his team to a playoff berth. He led the league with a .358 batting average, collecting 64 hits in 50 games. The Rangers decided to challenge their young shortstop by having him skip the rookie level in the Arizona Summer League and move up to short-season A-ball in Spokane (Wash.). The combination of an ankle injury, plus making the adjustment in moving from the Dominican Republic to eastern Washington made for a tough season, relatively. Against competition often three to four years older, he hit.267 with the Indians and committed 20 errors at short in 53 games. Perez, who served as the hitting coach at Spokane last season before coming to Hickory this season, said that Alberto had to learn to experience things different than what is in the Dominican. Coming into this season, Alberto feels that he has made the adjustments and the results have kept him in the top ten South Atlantic League hitters with a .326 average, while defensively he has made only seven errors. With the log jam at shortstop, Alberto is spending some time at third base and may experiment some at second to stay in the lineup as much as possible now and in the future. “Defensively, at shortstop, I didn’t know what we had until he started taking ground balls. He takes care of all the routine ones. He’s kind of a bigger shortstop and you think he’s not going to get to it and you look at where the other shortstops are, and he is.” 2012 Crawdads Manager Bill Richardson. “A couple of years ago, when we signed Profar and Sardinas and all those guys, he was part of it, too. Obviously we couldn’t have them all at the same spot, but we always talk about having waves. So, okay, here’s the first wave and then the second wave and he’s part of the next wave. But we never thought about him as he’s behind them. No, he’s right there with them.” 2012 Crawdads hitting coach Josue Perez about how Alberto fit in among the other Rangers’ infield prospects at the time. “Hanser is a nice sleeper. When I first got into this organization and saw all the middle infielders, I liked the way he played the best. He played with energy. He was always talking, always communicating. He played the game hard, always ran balls out. He played the game, from my perspective, the way it’s supposed to be played.” Casey Candaele, who was the Rangers infield coordinator in 2012. “It’s a God-given ability. You don’t teach that. I just try to keep doing what Josue tells me to do. Get on top of the ball and find the pitch that I’ve been looking for and hit it. Now, when I get to two strikes, I think about putting the ball in play. Before two strikes, I try to find that pitch that I want.” Hanser Alberto, when asked how he learned to hit. Thursday: Chad Sobotka (RH, 1-2, 4,73) and Brett Martin (LH, 3-1, 2.50); Friday: Caleb Beech (RH, 4-2, 2.06) and Collin Wiles (RH, 5-1, 1.37); Saturday: Max Povse (RH, 2-1, 2,43) and Nick Gardewine (RH, 3-3, 3.06); Sunday: Alec Grosser (RH, 3-2, 4.63) and Ariel Juado (RH, 7-0, 2.60). Hickory (32-14) finished off a three-game sweep of Delmarva (Md.) with a 4-2 win Wednesday afternoon… The Crawdads have won five straight and now have a five-game lead over the West Virginia Power in the South Atlantic League’s Northern Division…The bats have joined the hot pitching during the winning streak, as the Crawdads have put up 41 runs on 60 hits during that stretch…. 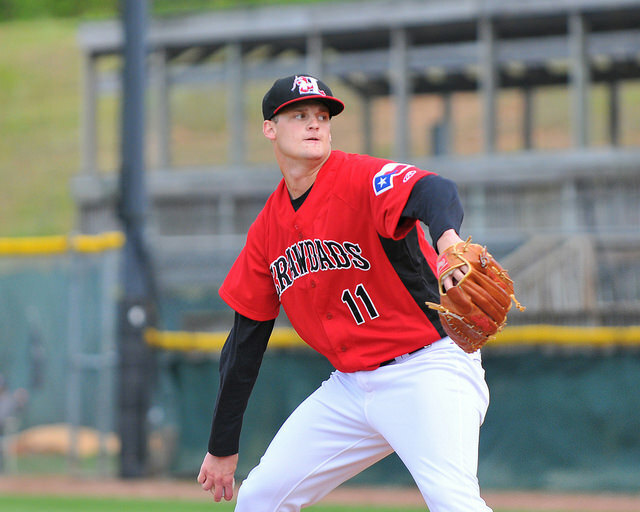 On the mound, the Crawdads continue to dominate opposing lineups. The starters have a 2.39 ERA for the season to go with a 1.12 WHIP. Hickory’s team ERA of 2.72 is well ahead of the Power’s 3.10 posting, and they have surrendered the fewest hits in the Sally League… Also, the team WHIP of 1.18 is a tick (1.17) behind West Virginia and the Crawdads are second in strikeouts… The starting pitchers have not allowed a homer in 16 games, spanning 83.1 innings (since May 11). Like Hickory, the Rome Braves (22-24) are in the midst of a five-game winning streak, which includes a three-game sweep at Charleston, S.C. The Braves are in fourth place in the Southern Division and trail Greenville (S.C.) by five games…Like the Crawdads, Rome burst out of a recent offensive funk (nine runs in six games) with 29 runs on 47 hits over the last five games…As a group, the Braves are patient at the plate and have the ability to wait for their pitch. Rome leads the SAL in walks, lead the league in OBP, and have the third fewest strikeouts. However, the power is nearly non-existent. The Braves have just ten homers this season, are last in doubles, and next to last in slugging (.336)…On the mound, the pitchers have allowed just ten earned runs in five games with 18 walks allowed and 51 strikeouts…Rome trails only Hickory in hits allowed, but has hit the most batters and given up the second most walks. SS Ozhaino Albies: No. 4 Braves prospect (mlb.com) and No. 96 overall. The 18-year-old native of Curacao is the third-youngest player currently in the SAL (one week older than Hickory’s Michael De Leon). He is at .288/ .353/ .359 as the R-Braves’ leadoff hitter with 19 steals. Albies has a hit in seven of his last eight games. In the field, he leads the SAL in games played at short (42), assists and double plays. RF Braxton Davidson: No. 7 Braves prospect was the first-round draft pick out of Asheville TC Roberson last June. Entering the series with a slash of .246/ .393/ .370, he leads the Braves with four homers and has shown a patient approach at times (33 BBs/ 49 Ks in 173 PAs). Was drafted as a first baseman, but moved to right field to make use of a strong arm. 3B Jordan Edgerton: Played at South Point High in nearby Gaston County, he leads the team with 31 RBI and is second in hits (50) behind Albies (53). Edgerton is the SAL leader in putouts and assists at third. He played his college ball at UNC Pembroke. C Tanner Murphy: No. 27 Braves prospect was the fourth-round selection by the Braves out of Maiden (MO) High in Poplar Bluff. Has struggled with the bat this season (.153/ .280/ .189), but enters the series with a mini-hitting streak of three games. Has thrown out 22 of 69 (31.9%) of runners attempting to steal. SP Alex Grosser: No 13 prospect, selected in the 11th round in 2013 out of TC Williams High in Alexandria, VA. Has shown control issues with 25 Ks/ 25 BBs in 44.2 innings, but keeps the ball on the ground (2.13 GO/AO in his career). Has surrendered one pro homer in 137.2 innings. SP Chad Sobotka: No. 27 prospect, taken in the 33rd round in 2014 out of USC-Upstate. Expected to make only his fifth start this season. Suffered a stress fracture in his back in his junior season in college. SP Max Provse: Braves third round pick in 2014 out of UNC Greensboro, pitched at Green Hope High in Cary, NC. The 6-8 hurler has a 2.43 ERA and 28 Ks in 29.2 innings. SP Ariel Jurado: Winners of seven out of eight starts, the sinkerballer has walked only five (40 Ks) in 44 innings. The 19-year-old threw two-hit ball over five innings his last time out against Delmarva. His 0.92 WHIP is the second lowest in the SAL, as is his BB-per-9 inning ratio (1.00). SP Collin Wiles: He continues to mix speeds to the frustration of SAL hitters, which have batted .219 against him this season. Wiles struck out a season high six during a six-inning start his last time out at Kannapolis. He is third in the SAL in ERA (1.37) and eighth (1.02) in WHIP. RP John Fasola: Has become the closest thing to a closer that Hickory’s had in a while. He leads the league with ten saves and has not allowed a run since giving up one at Greensboro on April 29 (9 games, 10.1 innings). Overal,l Fasola has 24 Ks and given up just three walks in 16 innings. 3B Josh Morgan: Continues to mash in May (.318/ .383/ .412). Enters the series with hits in ten of his last 11 games (15-for-39). Other than a double-error on a play at Kannapolis on May 17, Morgan has been errorless in the field in May. CF Jose Cardona: Went 6-for-10 in the two games he played against Delmarva in the previous series. 2B Travis Demeritte: Has reached base 10 of the last 21 trips to the plate. Curiously, has crushed RH pitching (.302/ .377/ .509) this season with four of his five HRs against them. Facing southpaws, Demeritte is .108/ .292/ .216. C Jose Trevino: Is 7-for-19 in his last four games to show signs of coming out of his month-long slump. Has not homered since April 26 (24 games), after hitting six in a 12-game stretch. LF Eduard Pinto: Has two three-hit games since returning from a short DL stint on May 23 (7-for-23 overall). Pitcher Cody Buckel – scheduled to make his first start at L.P. Frans Stadium in four seasons when he faces the Delmarva Shorebirds today (May 27) – was seemingly in the midst of a meteoric rise to the majors after a strong first full-season at Hickory in 2011. After posting a 2.61 ERA and fanning 120 in 96.2 innings with the Crawdads, his stock rose further at Myrtle Beach in 2012, when he named Baseball America’s Class High-A’s Pitcher of the Year. Buckel closed out the 2012 season as the Texas League’s (AA) “Pitcher of the Week”. Next spring, the then 20-year-old earned an invitation to major league spring training with the Texas Rangers in 2013. It all crumbled in 2013, when Buckel suddenly couldn’t find the plate. In the following interview, Buckel shares about the start of his troubles at AA Frisco, some of his rehab, and what he appreciates about the game four years after leaving Hickory. You came here last week, so let me start with what is the game plan for you? Buckel: To get back into starting and to get back into a starting role and get that routine back. It’s been a couple of years since I’ve been into a starting position. I think that’s where I’ll feel much more comfortable is getting back into a routine. Does it feel weird coming back here four years later? Buckel: I can honestly tell you, I never expected it – to be here – four years ago. But, it’s kind of a part of life. It just kind of throws you around. It’s the game of baseball and the unexpected lifestyle. I’m just trying, while I’m here, to make the most of it. You’re still only 22, which is not old for this league. Do you look at it that this is a chance to start fresh again? Or is it, gosh, I’ve got to come back here again? Buckel: It’s definitely a fresh start. It’s definitely a new opportunity. It’s not very likely in this game that you get many chances and I’ve been blessed to get three new chances. I’m starting over again and trying to find out who I am again. This is a great place to do it. What is the first thing you hope to find again coming here? Buckel: Just getting the routine back again. I had a really set routine back in 2011 and 2012, and I got away from it in 2013 and I really didn’t get to do it last year. Now that I’m starting again – coming here with a six-man rotation is a little different – but it’s going to be getting back into a routine, knowing what I have to do this year throwing wise, lifting wise, running wise. I just think that works out well for me. At the end of the year, what is success going to look like for you when you pack up and leave Labor Day, here or elsewhere? Buckel: It’s definitely being back into starting; to be able to get back and throw the five to seven innings again. Being able to take the team, regardless of how they’re playing, deep into games, Being able to throw all of my pitches for strikes. Being ahead in the count and use all of my pitches again. As far as stuff, what are you hoping to find again? Buckel: Stuff wise, it’s not necessarily the movement or the sharpness of it. It’s more just being to command it and use it in any count. That’s what I was really known, and really prided myself for, was being able to throw any pitch in any count, and being able to throw the ball wherever I wanted to throw it. The last few years have kind of been a struggle of finding command. It wasn’t necessarily that the stuff wasn’t good; I didn’t really throw it where I wanted to throw it. The first start I had here a couple of days ago, I actually had pretty good fastball command and I threw the curveball pretty well. I threw the changeup pretty well. It’s just finding, basically, the command of all of it. Take me through the start of 2013, which had to be just an absolute nightmare for you when you started at Frisco. Buckel: I was a young kid in big league camp and I let it get the best of me. I went down on the minor league side and I had two outings after that went really well. I thought it was the case of just getting down to Frisco and doing really well. There was something in my mind that turned off or clicked off, or something. In my last start, or my last outing, or really my last two outings, I really had no idea where the ball was going and I couldn’t figure out why, and that carried over to Frisco. It just kind of mentally drained me. There was one point where they thought I had mono; I had so much stress. I had put so much stress and pressure on myself. I spent the rest of that year down in Arizona just really re-learning how to throw the ball again. It was like I had a traumatic injury and had to learn how to walk again, but this time, it was learning how to throw again. Keith Comstock was very supportive and it worked out very well. In 2014, I was trying to jump back and start, I think, a little bit too soon. I wasn’t quite ready and I ended up in the bullpen. I had a pretty solid few months at the end of the year. This past offseason, I went to Australia and got a few starts under my belt and did pretty well down there. I did pretty well in spring training being able to go out and get three to five innings starting again. I went out to Frisco and went back to the pen and then I fell out of my routine again, because I wasn’t a starter at Frisco. I’m sure you remember Matt Thompson, who in a sense went through a lot of the same things, where in 2011 he just couldn’t find the plate anymore Did you have in the back of your mind, is this going to happen to me? Buckel: It did happen to me. It happened to me likewise in 2013. I couldn’t play catch from 30 feet away. It was embarrassing; you almost wanted to go home and cry every night because you couldn’t do what you loved. Did you have worries that you’d be released? When you get a call to the majors, will this all seem like a blip? Will you look back at it in appreciation? How do you think you will see it? Buckel: A necessary evil. Like I’ve said before, I never saw myself as a greedy or prideful kid. I think the game showed me that I was and I didn’t realize that I was. I knew I was good and I thought I was the best. I thought I was going to get to the major leagues at 21. That was the way I was going and that was the pressure I put on myself. Then, when I started falling away from that, the pressure overcame me and it dragged me down. So, I’ve learned now how to kind of relieve pressure. Even when I was struggling in 2014, or even in Frisco when I was struggling a little bit, I still didn’t feel as much pressure, or I didn’t get as hard on myself, which I used to do very much so. I used to be super hard on myself. One day, when I’m in the big leagues – obviously, I have to be able to get there – I’ll be looking at this as a necessary thing I had to go through. What do you appreciate most now that you maybe didn’t in 2011? Buckel: I had tunnel vision in 2011 and 2012. My sole focus was getting to the big leagues and my sole focus was baseball, baseball, baseball. I’ve just kind of open up the blinders to the side of my eyes, to realize that there’s more in the world than baseball. I’m not saying to take me away from baseball, or any of that. I can focus on baseball when I’m out at the field. Now when I’m away from the field, I can appreciate the things that baseball does for me, as far as traveling around the country, or have the friends I get to meet and the experiences I get to have. In 2011 and 2012, I didn’t even realize that. I just kind go to the field, get back to the apartment, come back to the field, go to the apartment. As the Delmarva Shorebirds visit L.P. Frans Stadium this week, a familiar face from years ago returns to Hickory. 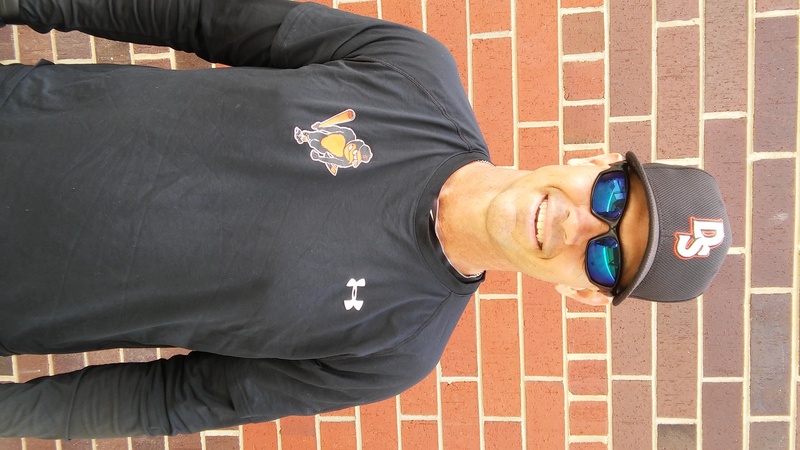 Current Shorebirds pitching coach Blaine Beatty served in the same role for Hickory in 2000. Since leaving the Crawdads after the season, Beatty returned to Hickory on the South Atlantic League circuit with Capital City (S.C.) in 2003 and 2004, as well as with Delmarva in 2009 when he served in the same role with the Shorebirds. Beatty’s 2000 team went on to send four pitchers and two catchers to the major leagues. The most highly-touted member of the group was David Williams, who still holds the Crawdads’ single-season mark in strikeouts (193) and Ks-per-nine innings (10.22). Williams went on to pitch for the Pittsburgh Pirates, Cincinnati Reds and New York Mets during a six-year, big league career. Delmarva Shorebirds pitching coach Blaine Beatty is in his second stint with the team, having served the team in 2009. Another former big league pitcher that Beatty continues to stay in touch with is D.J. Carrasco, who went on to pitch in eight major league seasons with five different clubs. Beatty said he recently had an opportunity to help Carrasco with a teaching venture in New Zealand. Beatty says he still keeps in touch with the two catchers – J.R. House and Ronny Paulino – that went on to have major league stints. One of those old times with Paulino involved a game against the Charleston (S.C.) RiverDogs. Many of the group from the 2000 club went on to Lynchburg (Va.) with Beatty in 2002 and winning the Carolina League championship that season. For the third straight game, the Hickory Crawdads put up a double-digit hit total and used shoddy Delmarva (Md.) defense to pound the Shorebirds 10-3 in the opener of a three-game series. After scoring eight total runs in a six-game stretch last week, the Crawdads (30-14) now have 28 runs on 40 hits during the current three-game win streak. Hickory remains four games up on second place West Virginia in the South Atlantic League’s Northern Division. Delmarva (22-22), which was a game back of Hickory on May 4, has lost 13 of its last 20. Hickory pounded out 16 hits and got the help of three crucial errors on potential double play balls to outpace the Shorebirds. Jose Cardona (4-for-5) led off the scoring with his fifth homer of the season in the third. One out later, Luke Tendler walked and Jose Trevino singled. It appeared the inning would end when Eduard Pinto slapped a ground ball to second. The Shorebirds recorded the second out, but Trevino’s hard slide into second altered the relay of shortstop Guillermo Salas to first and allowed Tendler to score on the error. The Crawdads added three unearned in the fifth against Matthew Grimes (3-2). After Tendler singled, Trevino pulled a curveball to third for what should’ve been a double play. But the throw from 3B Jomar Reyes was dropped by 2B Romansy Ledesma and allowed Tendler to move to third. One out later, Demeritte (3-for-5) smacked a grounder to short, but again Ledesma dropped the throw with Tendler scoring. Rock Shoulders’ sac fly brought in Trevino and Marcus Greene’s double scored Demeritte. That was more than enough for Ariel Jurado (7-0). After working out of trouble in the third and fourth innings, the 19-year-old finished with six shutout innings on two hits. He walked one, struck out six and recorded nine groundball outs. Hickory added four more in the seventh on a three-run blast by Demeritte (5) and a solo shot by Greene (4) made it 9-0. After Conor Bierfeldt spoiled the shutout with a three-run homer (7) in the eighth against Joe Filomeno, the Crawdads pieced together two hits, a walk, and a fielder’s choice for the final run on the eighth. David Perez worked around a two-out double in the ninth to close out the game. **Ariel Jurado was brilliant. Working off a 93-94 mph sinker, Jurado ofter worked in a change, an occasional slider and a tight curve, with which he got two called-third strikes. He destroyed Logan Uxa’s bat with a heavy sinker that he sent back to Jurado to end the third. He ended his night in the sixth with a 94 mph outside corner swinging strike to Ledesma, a curveball swinging strike to Bierfeldt, and a 93 mph inside corner swinging strike to Reyes. Jurado threw any pitch he wanted, whenever he wanted. Finished with 71 pitches – 53 strikes – and started 16 of 22 hitters with first-pitch strikes. **Nine two-strike hits by the offense! Six of those came after starting 0-2 or 1-2. Both the double and homer by Greene came on 0-2 pitches. Cardona’s homer in the third and a double in the seventh came after falling behind 1-2. **Travis Demeritte put up a solid overall game. He crushed a hanging curve from Mike Burke in the seventh. In the field, he made a strong jump-throw from behind the bag for an out and ranged deep to his right to corral another grounder. Demeritte makes the routine plays with an occasional plus play with a strong arm. **Josh Morgan and Jose Trevino teamed up on a key play in the fourth. Up 2-0 with Reyes at third and one out, the Crawdads played the infield back to concede a run. Elier Leyva smacked a sharp grounder to Morgan past the bag at third. Morgan scooped the grounder, then fired a bullet to Trevino at home. Trevino made the catch in front of the plate before slapping a tag on the cleat of Reyes trying to slide to the back tip of the plate. **Maybe it’s me, but for the first time since Michael De Leon came to Hickory a year ago, he looked tired. A nonchalant throw in the third kept the inning alive and turned a six-pitch inning into a 16-pitch inning for Jurado. At the plate, he went 0-for-5 with two called-third strikeouts and just didn’t have the usual spring-in-the-step at the plate. Again, maybe it’s just me. **Joe Filemeno had iffy fastball (92-94) command and it cost him on Bierfeldt’s HR in the eighth. He showed a decent slider in the seventh. One backdoor-variety in the inning had LH hitter Riley Palmer flinching. **With 16 hits, it’s hard to pick at the lineup too much, but situational hitting is still a work in progress. The Crawdads went 0-for-6 RISP in the first two innings and finished 3-for-17 for the game. **Eduard Pinto got caught trying to score from second on a fielder’s choice grounder. Palmer made the throw from first to Salas at short. While the throw was low, Salas made the catch and then had an easy out with the throw home to get Pinto. ** The “O!” chant from the Orioles fans (rooting for Delmarva) in the stands is quaint during the National Anthem. It was annoying Monday night given that it was Memorial Day. Sometimes, it’s not about you. The Hickory Crawdads return home to face the Delmarva Shorebirds in a three-game series tonight through Wednesday at L.P. Frans Stadium. Monday: Matthew Grimes (RH, 3-1, 4.93 ERA) and Ariel Juado (RH, 6-0, 3.00); Tuesday: Sebastian Vader (RH, 2-2, 3.09) and Luis Ortiz (RH, 2-0, 0.66); Wednesday: Bennett Parry (LH, 3-3, 2.95) and Cody Buckel (RH, 0-0, 0.00). 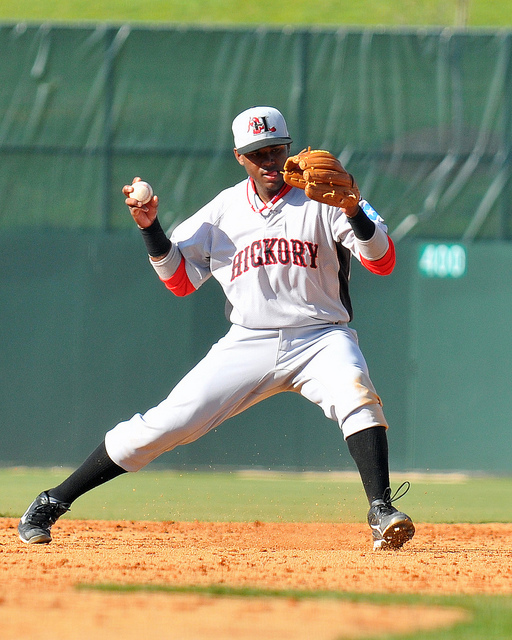 Hickory (29-14) burst out of an offensive tailspin with a ten-run, 14-hit effort Saturday night at Kannapolis, followed by eight runs on 10 hits yesterday afternoon. The Crawdads still lead the South Atlantic League’s Northern Division by four games over the West Virginia Power– who will play at Lakewood (N.J.) this week – and now lead third place Delmarva (22-21) and Hagerstown by seven games. As close as one game behind Hickory on May 4, the Shorebirds are 7-12 since after dropping three out of four at West Virginia over the weekend. Delmarva scored only four runs on 15 hits in losing the final three games of the series. A bigger loss for the Shorebirds is that of second baseman Steve Wilkerson (.309/ .417 /.391) to the disabled list. He is second in the SAL in OBP. 3B Jomar Reyes: The youngest player in the SAL stands an imposing 6-3, 220 lbs. He is currently the number 11 prospect (mlb.com) in the Orioles system. Already at 14 XBH’s in 148 at bats, he also has 32 strikeouts. Reyes is 13-for-48 (.342) in his last ten games, but went 1-for-12 with four Ks at West Viriginia. C Jonah Heim: No. 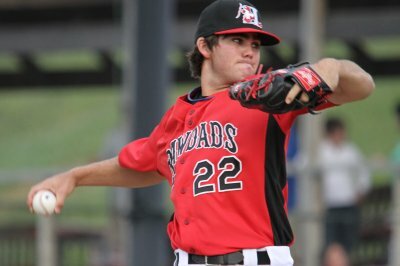 18 prospect of the Orioles (4th round, 2013- Amherst, NY) is at .260/ .290/ .373 for the season. Has thrown out only 11 of 42 runners attempting to steal. LF Conor Bierfeldt: The 29th round pick of the Orioles in 2013 (Western Connecticut St.) leads the SAL with 41 RBI. In his second season with the Shorebirds, Bierfeldt has 30 homers in 222 pro games, but has struggled to a .225/ .313/ .423 slash line this year. RP Zeke McGranahan: Attended Riverside High in Durham, NC (23rd round 2014- Georgia Gwinnett College), he currently has a 0.87 ERA in 20.2 innings with 28 strikeouts. He also is susceptible to wildness as shown by his 17 walks. RP: Donnie Hart: Currently is tied with Hickory’s John Fasola with a SAL-high nine saves and has yet to allow an earned run. Hart is a 27th round pick (2013) out of Texas St.
SP: Cody Buckel: Expected to make his second start of the season for Hickory on Wednesday. He started the season at AA Frisco before joining the Crawdads last week. Once on the short-list of top pitching prospects for the Rangers, Buckel suddenly couldn’t find the plate in 2013 (9 Ks/ 28 BBs in 9.1 IP at Frisco). Still only 22, he hopes to re-connect with the magic he had at Hickory in 2011 (8-3, 2.61 ERA, 1.14 WHIP, 120 Ks, 27 BBs in 96.2 IP). SP: Ariel Jurado: Winners of six out of seven starts, the sinkerballer has walked only four (34 Ks) in 39 innings. His 0.92 walks-per-9 innings is the second lowest in the SAL. SP: Luis Ortiz: His 0.66 ERA would lead the SAL, but he is seven innings shy of posting a qualifying mark. Like Jurado, Ortiz has also been stingy with the free passes, issuing only four (25 Ks) in 27.1 innings. RPs: David Perez and Adam Parks: The duo is second and third in the SAL respectively in Ks-per-9 innings among relievers. Perez’s ratio is 12.76, while Parks is at 12.33. 1B: Rock Shoulders: Finally broke his hitless streak (0-for-28) since joining the Crawdads on May 16. Hickory is looking for Shoulders to provide some of the power he showed with the Cubs farm system during which he posted 43 doubles and 30 homers in 208 games over the past two seasons. RF Luke Tendler: After smashing SAL pitching with a .346/ .378/ .708 line in April, it’s dropped to .241/ .323/ .289 in May. Still, he is tied for first in the SAL with 13 doubles, is second in total bases with 79, and fourth in slugging at .491. C Jose Trevino: Like Tendler, May has not been kind to the backstop (.247/ .256/ .325). He’s also struggled this season at LP Frans, hitting only .208 (.313 on the road). However, he shown life lately with four hits in his last nine ABs with two doubles. 3B Josh Morgan: He’s been the contrarian in the Crawdads struggles at the plate in May, posting a .312/ .384/ .416 line. During the Kannapolis series, Morgan went 7-for-18 with two walks and blasted his first homer of the season. Hickory Crawdads starting pitcher Collin Wiles is in his second season with the team after spending last year with the squad. The Overland Park, KS native was a compensation round pick (53rd overall) of the Texas Rangers in 2012 out of Blue Valley West High School. So far this season, Wiles is 5-1 with a 1.37 ERA, which in the South Atlantic League. Through May 23, Wiles has allowed 42 base runners and struck out 25 hitters in 39.1 innings. I caught up with Wiles after his start a week ago against Augusta when he gave up a run over five innings. Could you have dreamt of a better start to your season? Wiles: Yeah, I could’ve not given up any runs. Wiles: Realistically, it’s been a very good start. It’s nice to see that the hard work that has happened over the last three years has paid off in a sense. I’m in a really good place. I’ve got a pretty good idea about what I’m trying to do out there. That’s what everyone that I’ve ever worked with from the Rangers, that’s what they’ve been on me to do is to know who you are as a pitcher and have that belief that you’re the best. It’s nice to see it paying off early. When you and I have talked before, you talked about trying to blow it by everybody—trying to blow it by people. What was the point that convinced you that is not who you are? Wiles: When Greg Maddux talked to us at instructs last year. Wiles: He broke it down to the point of you don’t have to have velo, but you have to change speeds. The difference between a 90 mile-an-hour fastball and a 92 mile-an-hour fastball in the hitter’s eyes really isn’t that big of a difference. So, there’s really no need to try to get anything more. It’s all about putting the pitch where you want it. Something big that he said: After the game how he evaluated himself was based on good pitches and where he wanted them to go and if the glove moved at all when he threw it. That was really cool to see him talk about what he did and how he evaluated himself. I’ve taken that to here this year as a part of my evaluation. If I’m making good pitches – it’s not necessarily about getting outs, because you can get outs on bad pitches – it’s more about making good pitches, executing good pitches where you wanted them to be executed. That’s something that really stuck out to me when he talked to us. There’s a point where you hear that as theory and then you have to put it into practice. Is there a point where you began to see this work for you? Wiles: Yeah, offseason bullpens. We get a break from throwing – about a four-and-a-half, five week break off from even picking up a baseball. When you pick up a baseball again, it’s like hitting a refresh button. So everything that happened last year is gone. You’re working for this year; you’re looking to get ready for this year. Starting the offseason bullpens is where I started to figure out, okay, I made that really good pitch there, how many times in a row can I keep making that good pitch. Just challenging myself off of that in the offseason, and then in spring training keeping it going against live hitters, and then just having that same mentality here. As far as your stuff, what is the adjustment that you’ve made where you’ve said, okay, I’m not a strikeout pitcher, but I can get a ground ball? What was that progression? Wiles: Learning to pitch in the inner half, as well as going back to the outer half. I’ve always had good movement on my pitches. It’s all a matter of where you start them and where they end up. I’m trying to go to glove side and start it on the outside corner and know it’s going to come back in. So, just making a little adjustment and taking even four or five more inches inside or outside, if you will, and having it come back to where it’s in a place where you won’t get hurt. That’s been the biggest thing. Just like I said earlier about learning myself and trying to have an idea of what everything does when I throw it, so I can make adjustments on the fly. Today, I’m not getting my extension out in front on my glove side and it’s coming back over the middle of the plate. Well, I’ve got to move my sights even more and try and get it out even more to have it come back over the plate and not in the middle. The talk of (pitching at) High Desert is a whole different animal. It’s that something where you think, “if my stuff can play here, it can play anywhere.”? Is that something that’s in the back of your mind, or are you just worried about the here and now? Wiles: I’m just worried about now and trying to take it day by day. I’m just trying to get better here as much as I can. All the High Desert or anything else is really out of my control. The only thing I can worry about is how I pitch here. That’s the driving force is just getting better every day. We’ve had a good start to the season as a team, and obviously our pitching staff has. But that won’t matter if we don’t take care of business and continue it throughout the year. I’m just trying to get better every day. You talked about the starters – and they’ve definitely been the talk of the first quarter of the season – are guys looking to build off the success of each other? Wiles: Oh, definitely. Every time that a starter takes the mound – I don’t want to say that it’s a competition between the other starters – but it’s just kind of like, “Alright, you did that yesterday and I’m going to pick you up today and I’m going to get you tomorrow, and we’re going to do this again and we’re going to keep it going.” I think that’s been really good. We have starters that enjoy each other’s company. We’ll be in the dugout and we’ll be talking about, “alright, what are you throwing here to this guy?” We’ll keep going back and forth and say, “okay, if you want to throw that, what about this here?” The camaraderie amongst our fellow pitching staff has honestly been the biggest credit to our success. We’re not – I don’t want to say shy – but we’ll go out, even in a game. I’ll be in the dugout and say, “hey, I threw this pitch, what did you see out of the hitter,” and he’ll tell me instant feedback right there. It’s been good. Each one of us wants the other one to succeed just as bad as they want to succeed. If our team is winning at the end of the day, individual stats don’t really come into play. How much does Oscar Marin mean to this staff? Wiles: A tremendous amount. He’s taken us in and he’s kind of molded us into what he wants and I think he’s done a good job of doing that. His biggest thing is to never give in. Don’t be complacent. There’s still another three-quarters of a season left to be played, so he won’t ever let us get comfortable. He’s always pushing us. In our sides it’s, how many strikes can you throw today? How many balls down below the knees can you throw today? It’s been really, really good. It’s been something that, as young as a staff as we have, I think it’s been something that has kind of opened our eyes: this is competition every day. Not just on the days that we start, but every day, whether it’s a bullpen or playing catch, it’s some sort of competition. After a six-game stretch in which they scored eight total runs, the Hickory Crawdads equaled that in the first five innings Saturday en route to a 10-5 win over the Kannapolis Intimidators at CMC Northeast Stadium. In pounding out 14 hits, the Crawdads (28-14) snapped a season high, four-game losing streak and maintained a four-game lead over second place West Virginia. Hickory put the first four runners of the game on base, scoring three of them. Luke Tender singled in Jose Cardona for the first run, followed by a wild pitch – the first of six by Intimidators starter Yelmison Perralta – that put runners and second and third. Jose Trevino (2-for-5) reached on a double error by 3B Ryan Leonards with Michael De Leon scoring on the play. Eduard Pinto (2-for-5) – in his first at bat since returning from the disabled list earlier in the day – brought in Tendler with a grounder to short. Kannapolis (19-23) answered with two of its own in the bottom of the first against Collin Wiles. Eddy Alvarez and Christian Slater opened with sharp singles, and then worked a double steal. One out later, Leonards reached on an infield single to De Leon at short. Alvarez scored on the play with Slater following him to the plate after De Leon’s throw to first skipped away. Hickory caught a break as the rebound from De Leon’s throw went to Rock Shoulders at first, who then picked off Leonards when he tried to advance to second. The Crawdads returned serve in the second when Jose Cardona singled in Marcus Greene and Josh Morgan scored on a wild pitch. From there, Collin Wiles (5-1) held the opposing lineup in check through his six innings of work, as he retired 16 of the final 18 hitters he faced and struck out six. Hickory blew open the game with four in the fifth. Pinto tripled in two and then scored on a wild pitch from Peralta. Rock Shoulders’ snapped an 0-for-28 slump since he joined the Crawdads a week ago with a sharp single to center that chased Peralta (1-4). Reliever David Trexler walked the bases loaded before issuing his own wild pitch to score Shoulders. Kannapolis took advantage of a combined five walks by Scott Williams and Kelvin Vasquez to score three in the eighth before Vasquez stuck out Michael Danner to end the threat. Travis Demeritte’s RBI single in the ninth provided the final margin before Vasquez struck out the side to end the game. **The Crawdads lineup went back to what they were good at during the first month of the season—taking advantage of mistakes and taking extra bases when the opportunity presented itself. Cardona hit an 0-2 change (I think it was a change, speed gun function was not reliable) for a single to start the first, then took third on De Leon’s bouncer through the right side to set up Tendler’s RBI hit. Morgan’s first-to-third on Cardona’s single in the second set up his run on a Peralta wild pitch. ***Peralta threw six wild pitches, with Hickory runners taking off on several pitches that never left the home-plate circle. One such play involved Pinto in the fifth. When Peralta’s pitch stayed just behind catcher Zach Fish’s feet, Pinto was off from third on the dirt ball and slid in just under Fish’s tag. ** Of the starts I’ve seen Wiles make, this one may be my favorite. It was a night where Wiles did not have his best location early, but he figured out what he did have and worked with it. Wiles had problems keeping his fastball down in the first and the Intimidators made him pay with sharp singles. My memory of the 2014 Wiles is that he would try to bullrush people with heat looking for strikeouts. The 2015 Wiles has ditched the macho and is looking to make pitches. On the final out of the first, he got Mason Robbins to swing through a change, then came back with a fastball to get Robbins to loft a lazy fly to left. He parlayed that success into the second when Wiles pitched more off his change. He got Danner to swing through one for the first out. After getting Fish to whiff on a change for strike one, Wiles dialed up a 93 heater for the second K of the inning. A fastball up was punished for a double, but then Wiles worked a through an 8-pitch at bat with Eddy Alvarez before his first curveball of the night was taken for strike three. From there, Wiles mixed all three pitches and had the Intimidators off balance much of the remainder of the night. As I’ve stated in my blog introduction, I am not the most knowledgeable baseball person in the room. So, with that knowledge, I will say this. I can’t imagine Wiles is with Hickory much past the June all-star break. For now, he has figured out what he needs to do when he doesn’t have his best stuff. He’s become a pitcher that has embraced adjustments from pitch to pitch. **Good to see the dugout with some animation. It was especially prevalent on plays in which extra bases were taken. There was a funny moment when the dugout asked for the ball after Shoulders’ single in the fifth. ** Some guys get it. 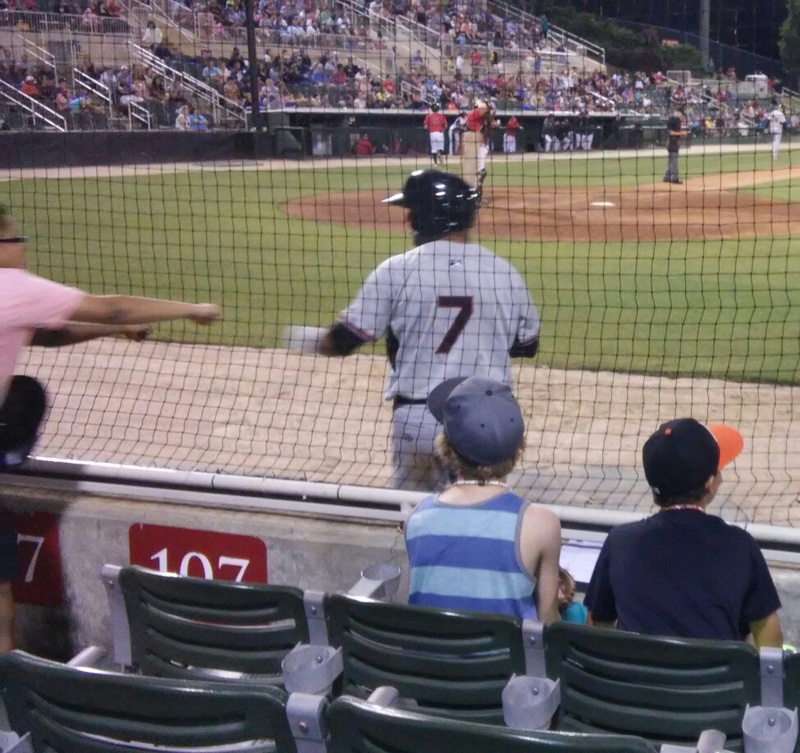 It was fun to watch Jose Trevino interact with a couple of pre-teens sitting near the on-deck circle. By the ninth inning, several kids were looking for fist bumps prior to Trevino’s lead off appearance. He did them all, then stepped to the plate and smacked a double to left-center. **Four walks by Scott Williams in 1.2 innings. He got bailed out by a horrific base-running blunder in the seventh that turned into a double play on a fly to right and got then a more conventional 6-4-3 DP in the eighth to keep the fledgling rally from getting out of hand. Williams now has six walks and only two Ks in 5.1 innings. With an overload of arms at Hickory and in Arizona awaiting a place to pitch, Williams will need to find the K-zone soon. ** The ups-and-downs of Vasquez. He gave up a walk and a hit batter following Williams into the game, followed by a two-run single. In the ninth, he dialed up several 97-98 mph pitches to fan the side. **Cardona got caught rounding first too wide on his RBI single and got thrown out trying to scramble back. However, that was part of the aggressive theme by base runners all night, so it’s hard to fault him on the play. **De Leon’s error was a rarity in which he tried to make a play that wasn’t there. His throw to first to catch a runner that would likely have reached safely allowed Singleton to score.